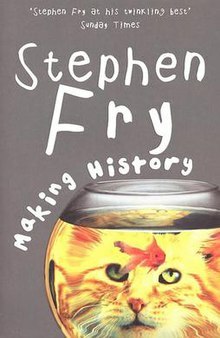 Making History (1996) is the third novel by Stephen Fry. The plot involves the creation of an alternative historical time line, one where Adolf Hitler never existed. While most of the book is written in standard prose, a couple of chapters are written in the format of a screenplay. The book won the Sidewise Award for Alternate History. The story is told in first person by Michael "Puppy" Young, a young history student at Cambridge University on the verge of completing his doctoral thesis on the early life of Adolf Hitler and his mother. He meets Professor Leo Zuckerman, a physicist who has a strong personal interest in Hitler, the rise of Nazism and the Holocaust. Michael assumes this is due to his Jewish heritage. However, it is later revealed that Leo was born Axel Bauer, the son of Dietrich Bauer, a Nazi doctor at Auschwitz. Leo has developed a machine that enables the past to be viewed—but it is of no practical use as the image is not resolvable into details. Together, they hatch a plan to modify the machine such that it can be used to send something back into time. They decide to use a permanent male contraceptive pill, stolen from Michael's girlfriend (a biochemistry researcher), who, due to his continual distraction, has left him to take a position at Princeton University. They decide to send this pill back in time to the well in Braunau am Inn so that Hitler's father will drink from it, become infertile, and Hitler will never be born. When Michael awakens he is completely disoriented. He soon discovers that he is in the United States, at Princeton University. Everyone he encounters is surprised that he is speaking with an English accent. It takes some time for Michael's memory to return. He realises that his plan was successful, history has changed, and for some reason his parents must have moved to America. Initially he is elated and tells his new friend Steve how happy he is because Steve has never heard of Hitler, Braunau am Inn, or the Nazi Party. Steve corrects Michael and reveals that he is well aware of the Nazi Party. Michael begins to discover the history of this new world. It turns out that without Hitler, a new leader emerged, Rudolf Gloder, who was equally ruthless. In fact, Michael and Zuckerman have replaced Hitler with a Nazi leader who was even more charming, patient, and effective, and as committed to the Final Solution as Hitler had been. In this alternative timeline, the Nazis won a mandate in the Reichstag in 1932 and built up an electronics industry of their own. Unlike Hitler, Gloder proceeded with stealth, ensuring peaceful unification with Austria in 1937. More alarmingly, Gloder's Nazis also had a head start on the research and development of nuclear weapons, which led to the destruction of Moscow and Leningrad, eliminating Joseph Stalin and his Politburo in this alternative 1938. The Greater German Reich annexes Czechoslovakia, Hungary, Yugoslavia, Poland, and Turkey, and invades the remnants of the former Soviet Union. In 1939, France, the United Kingdom, Scandinavia, and the Benelux nations capitulate, although Britain rebels in 1941, leading to the execution of several dissidents, among them the Duke of York (the historical King George VI). Jews are exiled to a "Jewish Free State" within the former Yugoslavia, where most of this world's Holocaust occurs. The United States develops nuclear weapons in 1941, leading to a Cold War between Nazi Germany, its satellites, and the United States. The latter has never gone to war against the Japanese Empire in the Pacific. As a result, this United States has become far more socially conservative. Because there was no sixties upsurge of social liberalism and decriminalisation of homosexuality in (Nazi-occupied) Western Europe in this world, the latter is still a felony, while racial segregation is still active. Steve turns out to be homosexual, and when he discovers Michael's background, he marvels at his talk of gay pride marches, urban gay communities, and a mass social movement in Michael's world of origin, regarding it as "utopian". Much to his surprise, Michael reciprocates Steve's feelings. Michael is apprehended by the authorities, who believe that he is a possible spy. Michael learns that the water from the well in Hitler's home town was used to create "Braunau Water", which was the instrument to sterilise the European Jews, wiping them out in one generation. In a cruel twist of fate, the person who perfected the synthesis was Dietrich Bauer. Once more his physicist son, Axel, is wracked with guilt and has developed a Temporal Imager. With Michael and Steve's help, they plan to send a dead rat to poison the well so that it will be pumped clean of the sterilising water. As they begin to do this, they are interrupted by the federal agents that apprehended Michael earlier and they end up shooting Steve, who dies in Michael's arms just as the time alteration occurs. Time changes again. Expecting the disorientation, Michael comes to his senses faster now and discovers that almost everything is back to how it was, except that his favourite band never existed. He gives up his career in academia, figuring he can at least make some money "writing" the songs that he remembers from the previous reality. Finally, Michael is reunited with Steve, who also remembers the previous reality. Their gay relationship is no longer criminal. Michiko Kakutani of The New York Times found the comic tone of the book "shockingly tasteless" and "deeply offensive" given the subject matter. ^ Notice of the British Library, retrieved 19 July 2009. "The World Hitler Never Made"
"Making History Cover Art History"